The Vestil CRF-120 is a 120½” Long Forklift Carpet Pole / Coil Ram that makes it easy to transport rolls of carpet, coil and roll material, or pipes weighing up to 2,200 LBS from work station to work station. 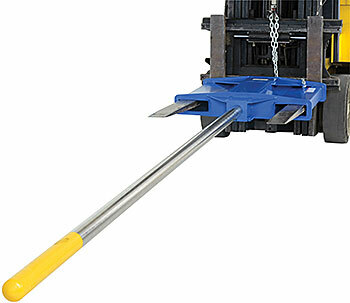 To use: simply drive forklift forks into the 7½"W x 2½"H fork pockets (on 24" centers) and attach the included safety restraint to secure unit to forklift. Carpet Pole features a 2¾" diameter rotatable pole with tapered tip. Constructed from fatigue resistant steel with blue finish and a bright yellow tip for improved depth perception. The CRF-120 is a high quality carpet pole designed to provide years of reliable service. WARNING: Load length should not exceed length of pole. Lifting roll material buried under other roll material will exert extra force on pole and may damage pole.